How would you make these doors? Or maybe a better question is how do you think this one was made? I have to make 2 doors to match this one and am trying to figure the best method of construction. Right now I'm leaning towards fabricating with just a plain square edge shaker style cope and stick, and loose tenons. Then add the molding by gluing to the edge and the plywood panel. Seems simple but I didn't think it was proper technique to glue a somewhat wide molding to a panel? But certainly seems to be what's going on here? I would cope and stick shaker square style then add shop made molding from my W&H to mdf panel. Unless you want to buy a huge shaper cutter or run the molding with the stiles and rails as one piece then jack miter. mill up the panel mold with a groove to go around the ply panel and a tongue to fit the door cope and stick. Running the panel step profile should be easy enough vertically, that would keep the cost of knives down also.The challenge would be to use materials that will be stable enough to not crack out at the mitres around the panel, I would go with an MDF. That is a type of door from the middle of the last century called the Miracle door. Why the name, I do not know. Perhaps it is due to the inner frame members and ply introducing an added resistance to movement. I have reproduced them several times. I usually saw the originals made in Red Gum. It is a 9 pc door, with a frame mitered around the ply panel - and glued to it. And the 4 pc coped and stuck, mortise and tenon rails then go around the inner frame in the conventional manner. The inner frame can also be coped and stuck and then mortises used. Alternately, the profiles (molded onto the frame edges, integral) can be stop mitered at the corners to avoid having to cope or have the tooling made. I think it desirable to mold the member edges rather than make loose moldings that are likely to come loose over time. And, in re-thinking it, I'd do the panel surround in solid stock, vertical grain if available. I said MDF originally because I recently had to do some cabinet doors the same way and used MDF for the surround. dam , are you in FL? i just quoted making those doors. only problem was customer wanted to buy cheap factory doors and apply moulding to both sides. doors were too thin to make exact match but i came close with 2 pieces. a stepped squarish piece, then a stepped flat piece. would have been easier to make complete door. Mark's cross section is a good way to make the doors. I would do similar, but make a full thickness plow about 1/2" deep into the major frame members, and let the secondary members fit right into it at about 1/4" thinner than the outer frame. Overall width and height variations in the inner frame, as well as stock straightness are more forgiving, in my experience. We made those to match my own home , we pretty much did it the way Mark drew it . First of all thanks for all the advice! And No Doug I'm not, but these days with an average temp of right around 9 degrees F, I wish I was! So I like the idea Mark presented in his sketch, oh and your wrong Mark, I totally needed the sketch:), actually feel kinda dumb for not thinking of it myself! So on that note I'll ask another dumb question....what's the best way to run that profile? My 1st though is to get the knives made so I can run it vertically as Mark suggested. Then when I run the piece leave it wider than the finished part by 3/8" or so which will support the piece after it's been shaped. Reverse it run it again on the other side. Then lay it flat and run the groove for the panel. Lastly figure out a support and rip off the extra support stock. Thanks a lot Mark! Makes a lot of sense and probably much better than I would have come up with! For cabinet doors and interiors doors in the past I've always used soft maple with glued up, (engineered), cores. But they were different style doors that lent themselves to hardwoods. The ones in this pic were 2-1/4" thick soft maple with mdf panels and weighed a ton! I'm not getting any younger and so thinking this might be a good situation for either a lighter hardwood, or a softwood since that's what these doors were typically made of. Unfortunately I have very little experience with softwoods and most of what I see is riddled with knots and sapwood. So thinking maybe a poplar door? Usually I don't like poplar for doors as it's too soft IMHO, but it's at least as hard as the Gum wood used for the originals. Oh and I'd still use the engineered stiles and rails. 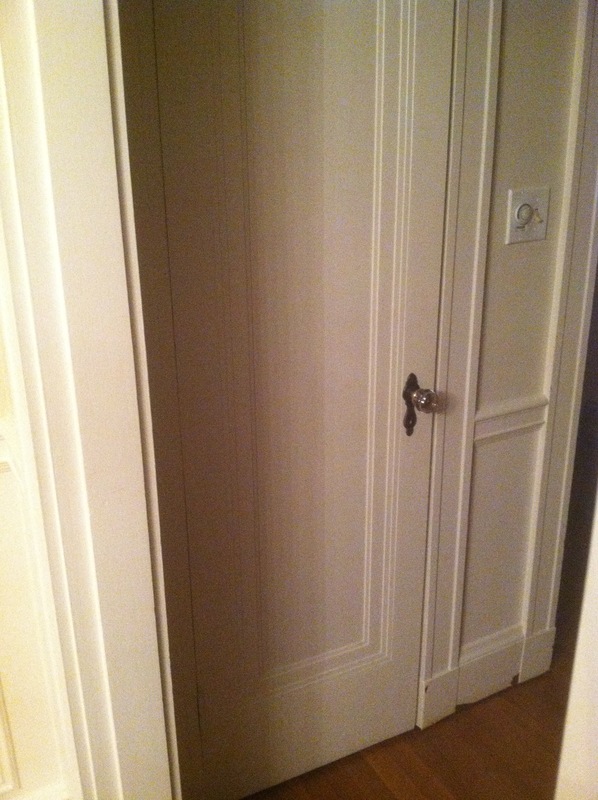 What are you guys using for these types of interior doors? For two doors I would try to do this with out buying cutters. Also I can't figure out how put the moulding around the panel then put that whole part in the stile and rails and have it fit perfectly. 1) Make stile and rails with typical dado and assemble. 2) With straight cutters make a piece that has the first two drops, a tongue on one side to go into the stile and rail and a dado on the panel side. Put in door with coped joinery. with glue. 4) Make the second section of molding which is just one step. 5) Glue this to one side of molding stop with mitered corners. 6) Flip door over, drop in panel and apply molding on second side. IMO having that cutter made for two doors would be too $. Material? Used to have good pattern mahogany for something like that- I'd be real picky about using poplar. I've even seen bass used for something like that. Since it's only two doors, I think some good soft maple should do it, maybe lay up a pine core? We use ribbon sapele to make our doors. Bass wood would certainly be light....but makes poplar seem hard comparatively. Don't think it would be a durable enough surface? Pattern mahogany is definitely out of the question, that would double the cost of the doors! Then the thought of covering that beautiful wood with paint! I just couldn't do it. I used some Sapele once for a project, stuff moved all over the place. Ended up having to redo a significant part of the project as a couple parts moved so much. Won't be going down that road again. I figured poplar may be the next best thing. I'd do pine as well if I could find a clear enough grade. I saw some select pine while I was at the lumberyard the other day, don't think I'd get a rail out of it without a knot, never mind a stile! Don't know where the door manufacturers get their stock but it's not easy to find here. How thick are the stiles and rails? Did you say 2 1/4"? You could use 12/4 quarter or rift sawed white oak. I would choose hardness over weight. 12/4 Rift Oak to make stiles? All due respect, but I don't know if I have ever seen 4 boards 12/4 Rift that would make a stile in my life. I could buy a truckload and never see a board to make a stile, and it would all be top grade. You would have to go to the mill, specify, and be prepared to pay real premiums and then more for proper kiln drying. W Oak is hard to dry. 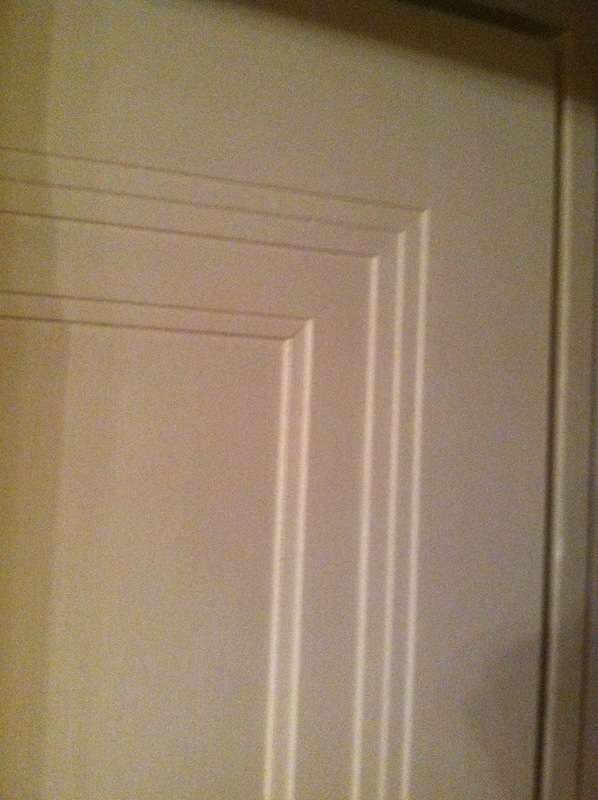 JeffD would be better off using pattern Honduras for his paint grade doors. The difficulty of sourcing good stile stock is why stiles are so often made with a b grade core and faces from 1/32 to 1/4" of good wood. That is a solution for many shops, and a good one. I don't like the time it takes, so I build paint grade in Poplar if it is on the low end, or soft Maple if I can tolerate another 15% in selling price. It is a bit harder and a bit heavier, but is more stable than Poplar for the most part. I buy about twice what I will need, try to specify or request optimal lengths, pull stiles first, and have plenty of stuff for set-up, drawers, blind panels or smaller stuff. I can glue for width if needed quickly and easily, so that is a card that is often played. I think larger loads give a better percentage of potential stiles than smaller loads. Unit/bundle quantities make it easy for your vendor. I cannot pick my lumber since all my stuff comes from a distance away, and it would cost twice as much if I added my labor to pick. I do talk to the vendors about what they have, tell them price is not much of a factor, and just request a honest appraisal of what they have on hand. Yup, Dave is right on, not to mention the fact that quartered rift white oak in general is not cheap or plentiful. I've used a lot of the stuff over the last 5 or 6 years and the thicker stock has gotten a LOT harder to source. I'm still thinking about using poplar for the laminated core. Is it unwise to use soft maple for a face? I've always done my doors with same species throughout. Just use the offcuts and less desirable pieces for the core and prime stuff gets re-sawn for faces and edges. I'm about 50/50 when it comes to sourcing lumber. Something like a kitchen I'll pick up the phone and get it delivered. Interior doors I'll still make the trip and pick my stock. Those guys picking aren't going to take time or effort to get me the best pieces. I've had a couple deliveries where I was tempted to send it back it was such poor quality! But as a small shop I also don't want to get on the bad side of my suppliers, so sometimes have to bite my tongue. Besides sometimes it's good to get out of the shop and take a ride....my main supplier is about a 40 minute drive, so not too bad. Of course was a lot easier from my last shop....only about 20 min. I don't think using a maple face over poplar core would be a problem for paint grade. I suggested pine because i just restored three 'antique' (1940's) exterior doors that had leaded glass lites. They were 3/16" rift white oak over a laid up white pine core. They were in good structural shape; I had to plow out and replace the strike edges etc, but all in all they held up very well. Ok so I started the doors last week and am making progress. I've decided to go with the poplar for the doors and see how it goes. Since it's only 2, and it's local, and the family are good clientele who will report back if anything is amiss....it's a good place to see how it works out. Anyway I have the outer stiles and the inner frame parts all milled. So what I'm wondering now is best way to assemble? I'm thinking of going the way I think Dave was saying, which is to glue the inner frame members to the plywood panel. Then have that entire panel assembly "floating" in the stiles and rails as a normal panel would? I just have to come up with something to keep it centered as I don't think spaceballs are gonna work here. 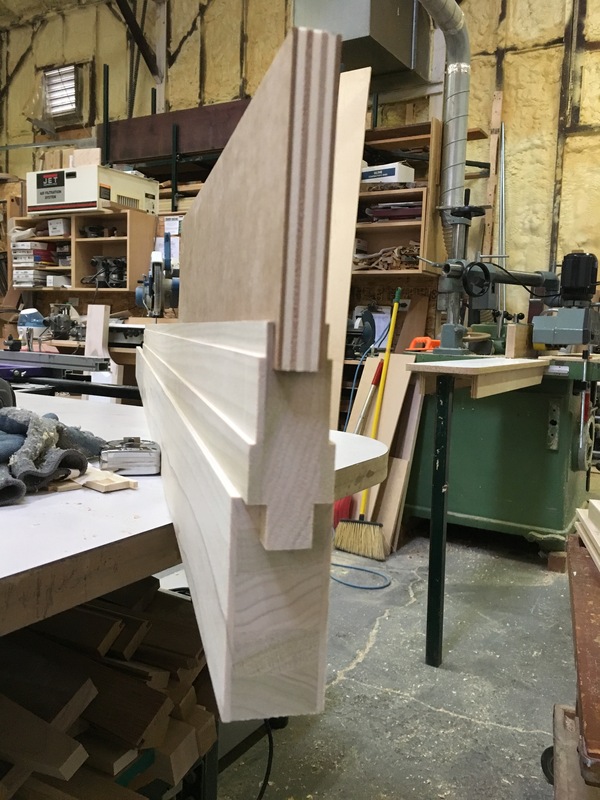 I thought David was suggesting that you house the inner frame in a dado as wide as the frame is thick so as not to have to size the parts so exactly. Your photo shows the inner frame tongued rather than fully housed.Do you plan to have a slight reveal around the inner frame? Given that scenario I would use some sticky backed foam weatherstrip to center the inner frames . Is that Plumaply you are using for the panels? Sorry, I meant Jeff. I wish there was an edit function. Thanks Kevin, looking back I think I've started mixing up the different methods guys have proposed! I really didn't like how thin the stile edge would get though if I recessed the entire assembly into the s&r's and decided against that method. Right now I'm deciding between gluing the inner frame to the outer frame tight and letting the panel float. Or leaving a reveal between inner and outer with the inner floating, and gluing the panel to the inner frame. There is one last section of profile about 3/32" x 1/2" that will be loose until final assembly and will be the last step between inner and outer frame and would cover any reveal. Though the more I think it through at this point it's probably better to glue the frames together into a solid piece and let the panel float. Otherwise that last piece is going to be problematic. My concern is will the miters then become a problem?